POLYPROPYLENE SURFACE W/ STEEL FRAME: Tough & reliable, steel frame securely holds to jumping surface for vigorous workouts. Jumping surface measures at 33.5L X 38W (inches). HEXAGON SHAPE: Hexagon Shaped surface gives more room for rebounding exercises. 42 durable grips hold the sturdy steel frame and jumping surface to eliminate risks of breaking. 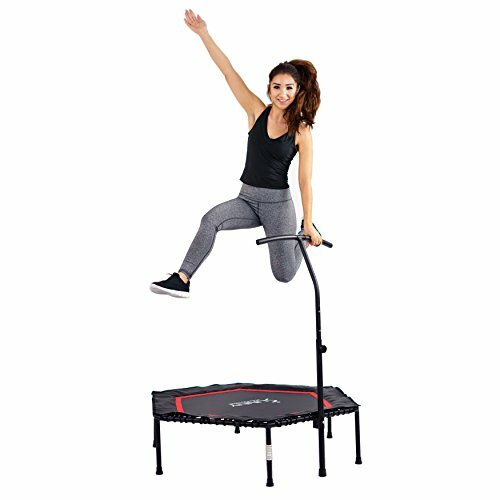 DURABLE FRAME: Ideal for men and women alike, this trampoline trainer has a compact design that allows it to fit in small spaces. Max weight capacity supports 220 pounds. 6 LEG PEGS FOR SUPPORT: Six detachable legs hold your weight during continuous bouncing. The protective cover is well-constructed and can withstand rigorous exercise.